Khartoon Khlassic combines color and conformation. Marla Melloway and Kelly Damaj have a special Khemosabi++++// son of their own, Khartoon Khlassic (Khemosabi++++// x Fantasstic). Marla notes, "Despite a kick in the front leg as a two month old colt, resulting in a compound fracture, he has proven himself to be a very successful breeding stallion." His video on YouTube describes Khartoon's miracle. Khartoon's amazing type and temperament. Have you always admired the Khemosabi++++// look with the blaze and four white stockings? Khartoon takes it a step further. Marla explains, "The Khemo 'look' is distinctive; the rich bay coloring with white markings, a wonderful disposition, nice smooth, well-balanced body. Khartoon inherited all of that from his sire, with something extra. A half bald face and a big white belly spot set him apart from the others. He happens to carry a gene that will produce wild splash white! All of his offspring are eligible for registration in the Pinto Horse Registry (many as colored stock), as well as the Arabian Horse Registry." Two of his most famous offspring are the full siblings, WA Outrageous+/ (Khartoon Khlassic x Gladiola Bey) and Pikhasso++/. 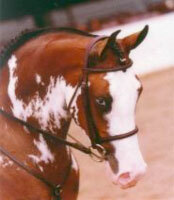 Outrageous was one of the first (if not the first) purebred blue-eyed pinto Arabians to be shown. With many Regional and National wins in Western, Hunter, and Sidesaddle for owners Gordon and Carol Walter, she was lost far too young. 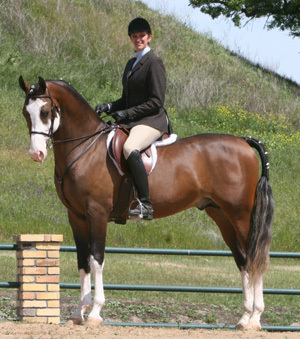 Pikhasso++/ can claim many Champion and Reserve Champion National sport horse titles, both in hand and under saddle. He also has a coat as loud as many of the cubist masterpieces by the artist he's named after. Proudly owned by Kelly Damaj, he continues to garner admiration and awards. Pikhasso with Loren Hart. Photo courtesy Gordon Walter. Marla continues, "Many more of Khartoon's offspring show at local and Class A shows, having become family horses. Others are out on the trails, with possible endurance races in their future. 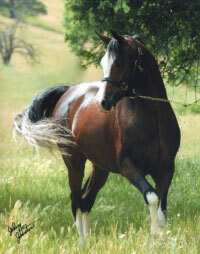 Three of his pinto purebred Arabians have been exported to Europe, and one to Canada." 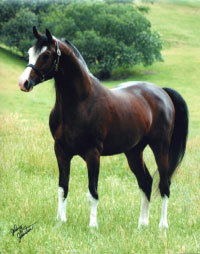 He also is one of the few SHN Payback stallions to have a son (Rhocky Rhoad) also in the SHN Payback Program. Summing it up, Marla says, "We are blessed to have this wonderful Khemosabi son in our lives."